With a wealth of marine life inhabiting Cape Town’s bays and the Atlantic Ocean beyond, it’s not uncommon to come across a seemingly stranded marine animal along the shoreline. While your first instinct may be to rush to its rescue, there are a few things to keep in mind to ensure both your own and the animal’s safety. Observe the animal from a distance. Spend some time watching it to establish whether it seems to be in distress, pain or discomfort. Keep other people and pets away from investigating it. Don’t touch, pick it up or pour water on it. Even if it does seem in need of help, remain at a safe distance. Remember that these creatures are wild and may cause you harm out of a sheer instinctive need to protect themselves. Apart from this, your presence may cause it further stress. Don’t try to return it to the ocean. Some marine animals, such as seals, often make their way to shore to have a bit of a rest and would not appreciate you ushering it back into the waves. Just because the seal is not moving, or sitting alone, does not mean it is sick or in need of help. Report! If it does seem like the animal is in obvious distress, pain it should be reported to the relevant authorities. 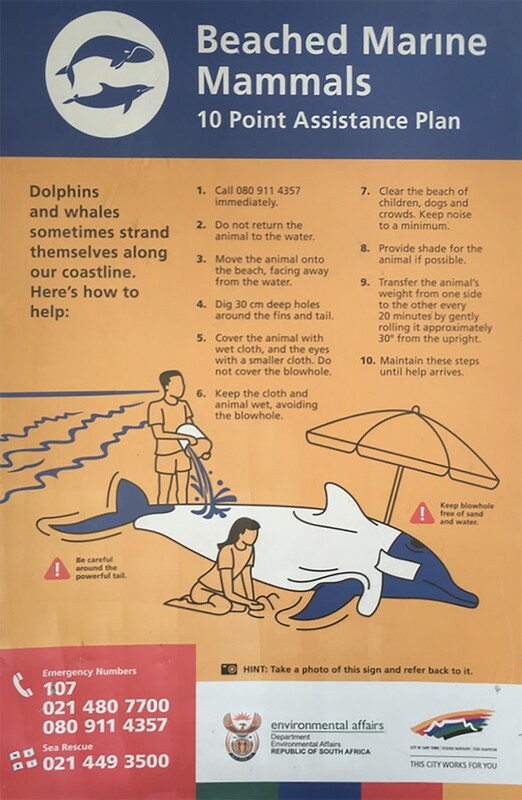 Time is of the essence, especially in the case of whales and dolphins that have beached. When reporting the stranded animal, it’s very important that you can identify what kind of creature it is. While you may not know the exact species, it will be important to explain whether it’s a whale, dolphin, seal, seagull, penguin etc, so that rescuers bring the correct equipment. Once you’ve identified it, being able to describe what sort of distress it’s in would also be helpful. Try to note any injuries, strange sounds, unusual movements, as well as any distinguishing physical features. Giving specific details about the animal’s location is of the utmost importance, as it would save the rescue team a lot of time not having to figure it out themselves. Don’t move from the spot until the rescue team arrives. They might need you to describe the scene prior to their arrival. Some of the common creatures you may discover on the beach that do need help are hatchling sea turtles. These can be collected, put in a dry box and driven to the Two Ocean Aquarium (contact below). These little turtles have been caught up in adverse sea conditions and are not able to return to the warm ocean currents they need to live in. Give the aquarium a call and help them in rehabilitating these little creatures. While these pointers are all good and well, the most important thing you need to know is who the relevant people would be to contact. The popular Cape Town tourist attraction is not just a fun place to visit, but also play a major role in protecting a wide array of vulnerable marine species. Some of their longest running conservation projects include rehabilitating stranded baby loggerhead turtles that wash up along the Western Cape coastline during winter and helping seals caught in snares of fishing line, raffia and plastic in and around Table Bay Harbour. Contact them on +27 21 418 3823 to report sightings of seals or turtles in distress. While you may think the National Sea Rescue Institute (NSRI) is limited to saving the lives of humans who find themselves stranded out at sea, they also play a vital role in helping marine mammals stranded on the shore.